Marking Remembrance Day with a movie and popcorn? Well, in this case it was appropriate given that the film was a documentary about the XII Manitoba Dragoons. Filmmaker Graham Street retraced the path the regiment took as it helped liberate Europe in the Second World War. In that sense, Street says, the film itself is a tribute to the liberty the soldiers helped to defend. 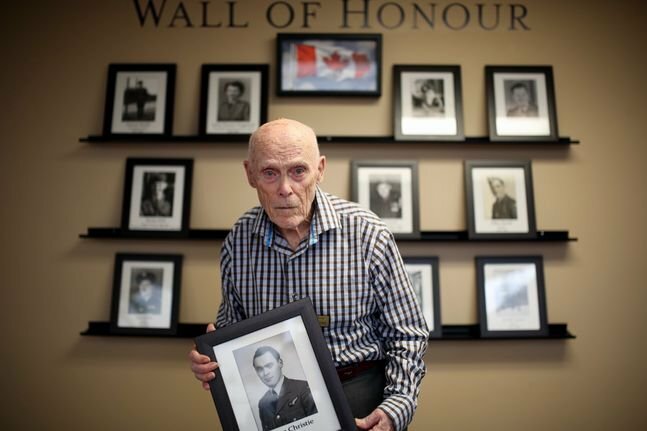 "Without the men from the XII Manitoba Dragoons, the footage that I capture of them now probably might not have been possible at this point if they hadn’t sacrificed what they did," Street said. "Because, who knows what the world would have been like?" "Then and Now: Life in the Regiment" premiered on Friday at the Evans Theatre at Brandon University. It took two years to make, and Street had the assistance of Shaun Cameron and Nate Bower. Veterans of the regiment were among those in the audience for the 50-minute film’s premiere. 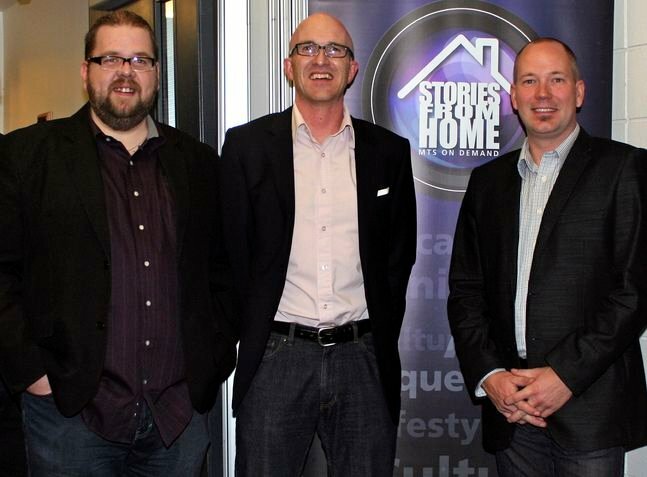 It’s now available to view as part of MTS’s Stories from Home programming. MTS funded the film, which is free to all MTS Ultimate TV customers through video-on-demand. The movie uses footage taken by members of the regiment themselves during the Second World War in Europe to create the "Then" aspect of the film. While it shows some battle scenes, much of the footage shows life when the soldiers weren’t in the midst of fighting — from training near Virden to a liberation ceremony in Ostend, Belgium. "It’s not Department of Defence footage, it is from the unit level, so it’s very, very authentic," Street said. Street’s role was to provide the "Now" of "Then and Now." He followed the path of the XII Manitoba Dragoons through Europe and filmed footage in the same locations from the same angles to show how the areas look now. In that way, past and present are connected and the movie shows the world made possible by the regiment’s efforts. The regiment’s task was reconnaissance. They went ahead of the main allied force to scout German positions, then relayed what they found back to commanders to decide on a course of action. Using quick armoured scout cars, sometimes they were days ahead of their fellow soldiers in the allied force behind. As such, they were the first troops that liberated Europeans would see as the German army. Former regiment member 93-year-old Jack Houston saw the film for the first time Friday. Not only was he a subject of the film as one of the soldiers who served with the regiment, but he was also interviewed by Street for modern perspective. The film showed mainly the better times of the regiment’s time in Europe, Houston said — not, for example, when 17 lives were lost in one day due to friendly fire. But the film is a fitting tribute to the task that regiment members undertook on behalf of its government, he said. "The film shows that it was a success," Houston said. Houston said that he hoped the movie would help audiences appreciate the sacrifice he and his colleagues made. "Just be thankful that we went and preserved the peace and harmony that we’ve enjoyed in this country for so long," Houston asked. "Every one of those men had their life on the line at any moment." Bill Pierson, who is from the Eden area, was a member of the 12 Manitoba Dragoons in the 1960s as a reservist. He marvelled at the footage taken during the war and said it made him proud to be a former regiment member and others should be pleased, too. "They should be proud of it," Pierson said. The XII Manitoba Dragoons Museum helped produce the film, and is located at the Brandon Armoury. 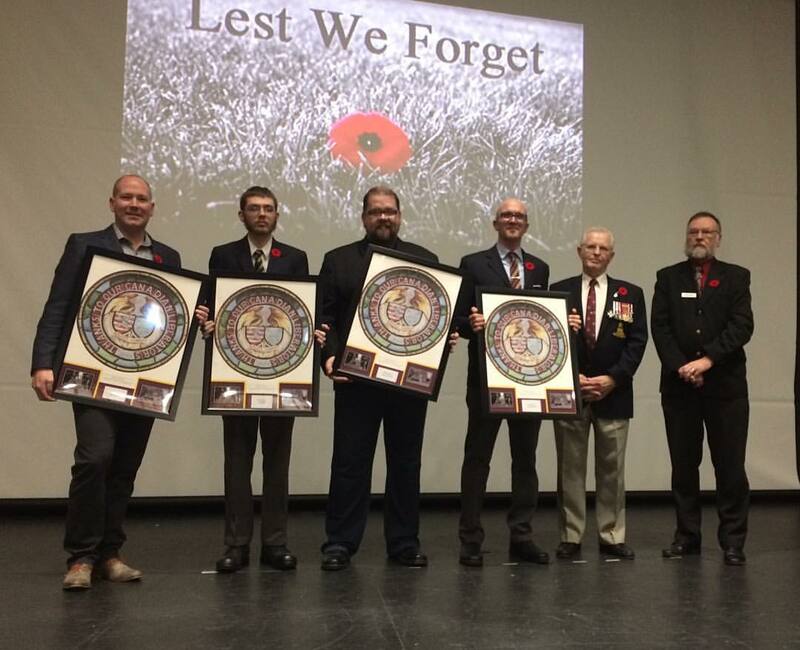 were presented with momentos of their hard work by members of the Xll Manitoba Dragoons Museum. President 26th Field Regiment / Xll Manitoba Dragoons Museum and Glenn Ball, Secretary, Museum Board. Over $800.00 was raised for the museum through donations by the near capacity crowd. that sits on the retirement home’s Wall of Honour, commemorating veterans that reside there. at the Commonwealth Air Training Plan Museum on Remembrance Day at 2 p.m.
Flipping through the pages of his wartime memoirs, Doug Christie pointed to a photo of an aircraft and quipped, "Here’s the office." The Second World War veteran, now 97 years old, served as a tail gunner during the war. The "office," as he called it, was a Boulton Paul Type E Turret. Christie completed 30 missions by the time the war ended in 1945. Christie recently received the first shipment of his memoir, "Some Experience," just in time for Remembrance Day. He will be at the Commonwealth Air Training Plan Museum on Friday at 2 p.m., where he will sell and sign copies of his book. Stephen Hayter, executive director of the CATPM, said Christie is the perfect guest for their Remembrance Day event, and a living reminder of what the memorial day is all about. "There won’t be too many more chances to have the opportunity to talk one-on-one with a World War Two veteran, so we thought it would be a neat opportunity," Hayter said. As The Brandon Sun reported last May, the book came about thanks to an incidental friendship at a Brandon retirement home. Christie met Joan Dillon who was visiting her mother at Riverheights Terrace. They talked about Christie’s wartime experiences, and he showed her a package of handwritten notes. Christie kept records of his missions, and made a point to collect the newspaper the day "after each operation." Together, Christie and Dillon worked on the book, with some historical context added in. Christie served with the No. 6 Royal Canadian Air Force Group Bomber Command after joining at the age of 21. It was his job to defend the bombers from enemy fire, from his perch in a turret located at the rear of the aircraft. He originally wanted to share his stories for his children, but after some encouragement decided to sell it to a wider audience. "Joan talked me into publishing it, and selling it — so we’re doing it," Christie said, adding Dillon did a "crackerjack job of arranging it." Dillon is originally from Hamiota, and has lived in the Netherlands for more than 40 years. "A lot of Doug’s flights I’m sure went right over here on the way to Germany," Dillon said in a telephone interview on Wednesday from Enschede, near the German border. Dillon said she enjoyed working on the project, helping with research and learning about the war along the way. "It’s very interesting, and just to imagine what they went through … I mean they were flying these missions in the night, and cooped up in these turrets, and my goodness, it really was quite the thing." Dillon also spoke about a war cemetery near her home which has 1,394 Canadian soldiers buried there. "Everybody’s got stories about the war, and I visit the cemetery every year out of respect," she said. "The interest in it hasn’t waned, and I think that’s really great because we mustn’t forget what can happen and what these fellows went through." will debut at the Evans Theatre Nov. 11 at 2 p.m.
who were two of many industry professionals to help make the film. "Then and Now: Life in the Regiment," a documentary film produced by Street Media in conjunction with the XII Manitoba Dragoons Museum for MTS TV "Stories From Home," will be premiering at Brandon University’s Evans Theatre on Nov. 11 at 2 p.m. Hosted bydocumentary filmmaker and Assiniboine Community College interactive media arts instructor Graham Street, this documentary follows in the footsteps of the XII Manitoba Dragoons as they trained within the province and then when overseas to fight for their country in the Second World War. Using film footage gathered during the conflict, Street pieces together the regiment’s journey, capturing the "Now" footage and comparing it to what the regiment saw "Then." "It was a highly educational and fulfilling experience to work with the XII Manitoba Dragoons Museum on this project," Street said. "With the support for local storytelling and independent production provided by MTS TV ‘Stories From Home,’ we were able to literally follow in the footsteps of the XII Manitoba Dragoons during the Second World War, starting right here in Brandon and then over to the United Kingdom, Belgium, Holland and Germany." Local filmmakers Shaun Cameron and Nate Bower were two of many industry professionals to also work on this project. 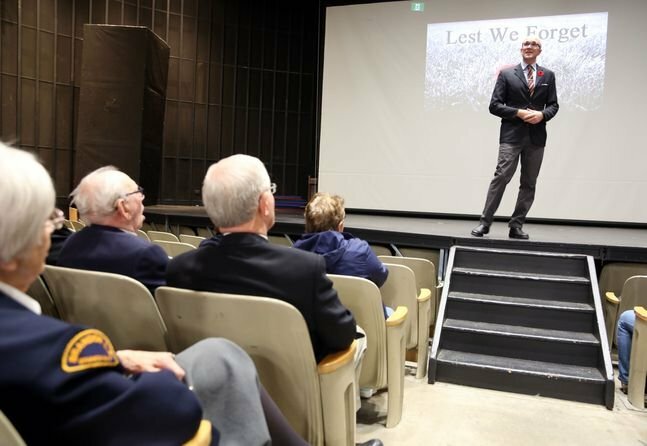 "The documentary that Mr. Street has produced is a must-see for anyone who has a relative who served in the Canadian Army in World War Two," Dragoons curator Edd McArthur said. "The integration of the original film and the ‘Now’ footage is seamless and helps explain the original film. I would recommend seeing this film to everyone. My thanks to the museum volunteers for their help with this project." by R. Ghandhi Midnight in the European countryside, carrying all of their provisions, including their rifles and ammo, they waded through an ice-cold river, as they heard the sudden order to stop and stand still. Lines of men halted as the water quietly-rushed around them, knowing that any of their movements could give their position away. Standing there in the dark, wet and cold, they could not even afford to let out a shiver, as their hands shook while keeping their rifles above water. Even the crickets had stopped chirping on this moonless night, testing each mans endurance over hunger, sleep, and their basic human needs. The order, which could last a few minutes or a few hours, seemed to last an eternity. For each man knew that his life depended on the man in front of him, and that each of their actions would define the course of history. It was a different time then. A time when the words life and death held more gravity to our everyday lives than they ever could today, and a time when all Canadians became brothers and sisters against one enemy. Trust amongst men was easier to find then, than in today's wired times. World War II had arrived at our borders and was threatening our way of life. We could fall to the future dictators, or we could rise against them as one common force, as proud Canadians. The choice was obvious, but not simple. At home, the families of our returning injured troops were provided a pamphlet, issued by the Canadian Armed Forces, instructing us on how to prepare for their return home. The instructions included subjects on how to knit covers for their amputated limbs, how to accommodate for their physical handicaps, how to avoid certain discussion topics, and how to act upon their return home. These were the same fathers and sons, who had left us months ago, returned to us now with not only their visible scars, but with the scars that only war could bring. For many, their return was enough, as many more did not return at all. In the future, we will only be able to imagine what each man was thinking as the waist-deep water seeped through their uniform. As for today, we do not need our imaginations, as these heroes are still here living among us, within our generation. We are still fortunate enough to hear their stories first-hand. All we need to do is ask. Our veterans are the superheroes of our proud Canadian history and are the living icons of our Canadian heritage experience. Our current good fortune is due to their sacrifices, their courage, and their pride, as Canadians, to fight for their beliefs. Ideals which our current societies seem to have forgotten. Their stories should be compulsory teaching in our schools, taking precedence over any spiritual or ethical lessons we are foolishly attempting to provide today. These men and women must be afforded the greatest of honour and respect from each one of us, as without them our world would simply not be, our world. As the leaves fall and silently hit our yards, we know they have done their job in supporting the trees from which they came. Just like the men and women who sacrificed their lives and livelihoods to allow us the freedom and opportunities we hold today. Yet, unlike our leaves, our fallen rarely went down in silence, while carrying our dreams and our futures with them. Whether by taking a stand against world dictators or to protect our own Canadian way of life, all members of our society collectively fought together as one common force. Wearing the poppy not only allows us to remember the people we lost in those struggles, but redefines our beliefs in their personal sacrifices. 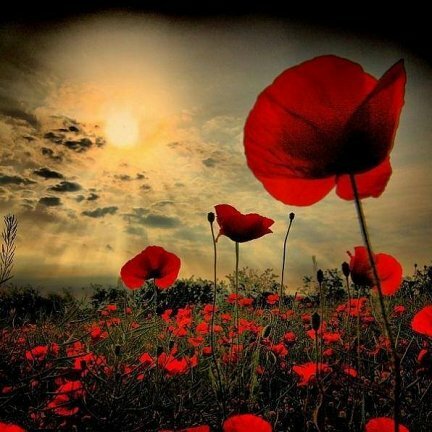 For only those proudly wearing the poppy each year, can truly see the honour behind the flower. So when you see our veterans proudly promoting poppies, go over and share a smile with them. Ask them about their stories, and about their lives. Their words have more meaning to us than any Hollywood script could capture. 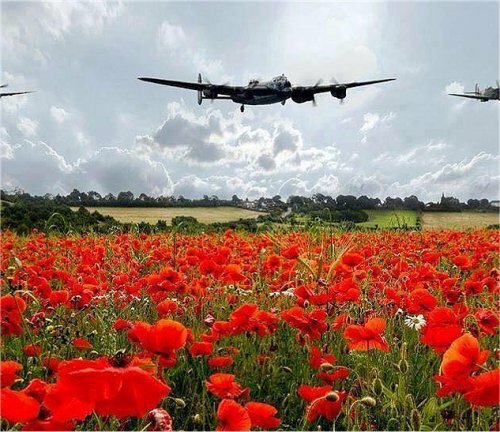 Buying a poppy is the very least that they deserve from us, and is guaranteed to give you the most patriotic feeling, that you have felt in a long time. Knowing that these stories come from real people, in real times, could only add to our own experiences. He was not only a great hero to us, but a member of our extended family. We will always miss his great stories, some of war, and some not. His flair for humour was only matched by his pride as a Canadian soldier through his many WWII European campaigns. The people of Holland presented him with his last medal only a few years ago, something he was always proud of....as we will always be of him! Thanks George, we love you and miss you more than you know...this is for you...with a smile and a cheer!